Young Miss S and her mother came by this morning. One of my goals for spring break is to spend some time with the grands. Our sunshine is hit and miss these days, but no rain fell, so we set off for a little walk to see the flowers. The naturalized lawn we pass is now scattered with blue Scilla, also known as Siberian Squill. It's visible in the background above. There are just a few Henderson's Shooting Stars in bloom: the pink flower in sharp focus above. A close up of the Shooting Star, aptly named, don't you think? A cluster of Scilla grows between the rock wall and the sidewalk in a perfect bouquet form. 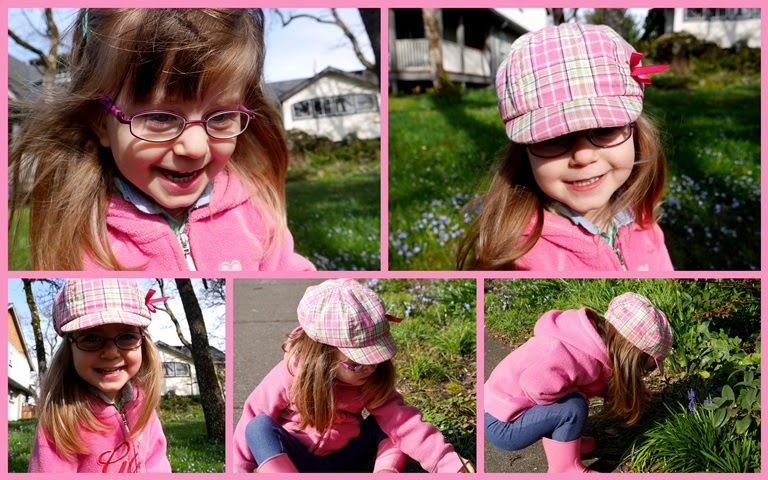 A collage of our Little Miss with her coordinated hat, boots, jacket and glasses. I love how closely she inspected the grape hyacinths growing beside the sidewalk. She squatted down, stroked the flower, turned it this way and that, all without pulling it up. Late morning we picked up cousin Miss A from preschool and had a special lunch together at McDonald's. I won't need to return there any time soon. Then off went Miss S homeward for her afternoon nap, while Miss A and I visited Butchart Gardens. That will be the subject of tomorrow's post. How lovely the coordinating outfit is! A lovely little girl and some really pretty flowers! Miss S looks a little like you, Lorrie! I can see something of a resemblance. Pretty in pink with flowers and spring time! McD--the things we sacrifice for our grands! LOL. A beautiful and fun day. I'm enjoying the bits of sunshine we are getting. Awww...they are beautiful (both the flowers and the Little Miss)! Miss S looks like a little flower herself. How nice to have a sweet companion on your walk to see flowers! Yup another one lost. Sigh. Maybe this will hold my spot. Love seeing spring not only in posies and green and spring showers, but also in cute little grandgirlies. It was a very enjoyable walk. I'm just reviewing my own pictures this evening. She is the prettiest flower of them all, Little Miss S. I love her color coordinated outfit and her gentle appreciation of the flowers. A trip to Butchart Gardens... I'm turning green with envy. You can be assured I will be back tomorrow. Gorgeous photos and what an attractive outfit - I love the pink plaid cap, very dapper! On walks with my girls in years gone by, they loved picking a few flowers to take home to Mummy. Mostly they were too short to pop into a vase!